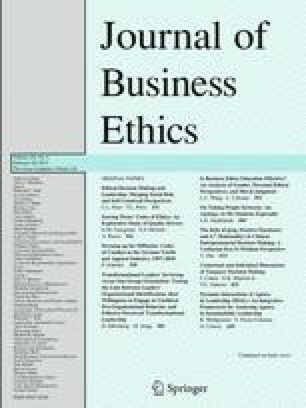 We thank Muel Kaptein, Editor of the Journal of Business Ethics, and the anonymous reviewers for their comments and support. We also thank Valentina Cortellazzi for her support in collecting data. Participants at the European Business Ethics Network (EBEN) 2012 Research Conference, New Castle, 7–9 June, and at 12th European Academy of Management Annual Conference, Rotterdam, 6–8 June, 2012 are also gratefully acknowledged for their comments. The authors contributed equally to this work and are listed in alphabetical order.